The 90 were a tough time for The Avengers comic, heck for any comic that wasn’t Spider-man, X-men or some guy from Gotham. The WCA was disbanded by Vision which cause many members to leave in protest to form Force Works. They then had to go through god awful costume changes, some bad storylines (not all were bad though) and had to be rebooted in the Reborn arc. However, by the end of the century, they returned to form when they returned from the Heroes Reborn universe in the Heroes Returns arc. As for recruits, The Eternal Sersi joined the team to replace Gilgamesh when he was injure and Stingray was made a member when he offered his Hydrobase as a base for the team. Spider-man previously tried to joined the team but failed to do until now when he was given a reserve membership alongside his recently reform foe Sandman and Rage who was demoted to trainee status when he was discovered his was underage. Machine Man was given reserve status after helping the WCA and Living lightning and Spider-woman (Julia Carpenter) joined after the team defeat the Legion of the Living Lightning. Crystal joined the team when her husband, Quicksilver, returned the team and Thunderstrike, who was going under Thor at the time, joined the team. Darkhawk became the last recruit of the WCA and the Avengers before they were believed killed in the Onslaught saga. When they returned to the leaving many of the core member rejoined and added New Warriors, Justice and Firestar, into the roster. Spider-man had previously tried to join the Avengers a few times. One time, he was tasked with capturing the Hulk but failed in that task. However after a mission against Nebula, he was given reserve status alongside Sandman and Rage. He would later become a full-time member in the New Avengers, after the team had disbanded during the disassemble arc. He remained with the team only leaving when he was on the Uncanny team because of Deadpool. He has since rejoined the main team. Sandman had fuse with Hydro-man with created the Mud Monster. After the separated, this cause Sandman to rethink his life choices. He reformed and tried to start a hero career. Thanks to his effort to reform he was given reserve status in the Avengers. He never served on any missions as he was soon turned evil again by the Wizard. The Robot from the future, MM fought alongside the West Coast team and stay with the team before given reserve membership. His term was short-lived as he was eventually captured by SHIELD and used to build a new Deathlok. 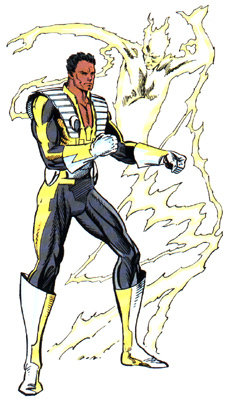 His membership was revoked after he attack Firestar and Justice but has been seen helping the team from time to time. Julia Carpenter’s Spider-woman first encounter with the Avengers was actually her first appearance in the original Secret Wars. In that it was revealed that she had been a hero for a while when she was kidnapped. She later helped the West Coast team when she was helped the team against The Legion of the Living Lightning. After the team was forced to disband she joined up with Iron Man’s Force Works team in protest. She has since lost her Spider power only to give Madame Web precog powers. Darkhawk literally burst onto the scene when he joined the West Coast team. He tenure was short-lived. He would go onto joined other teams like The Loners and was a big part of the War of Kings and Realms of Kings. He was later seen in the Avengers Arena series where he was thought killed but survived. Why? : Just like Gilgamesh, Sersi fall under a whole legal issue with the Kirby Family. Not only that but she really hasn’t seen much since the Eternal mini series. Why? : Stingray may not be a name everybody knows but he is currently in the Merc for Money team which is a Deadpool team so the likelihood of him being made in a DP wave rather than a Avengers wave is high. They could even use the Darkhawk figure as a base. Why? : Rage has never been a character people would put on their wish list. However, thanks to the New Warrior TV series coming and the fact that he was made into a MU figure, his chances has skyrocketed to possible. Why? : Even though marks the first LGBT member of the Avengers, he has not been seen in books for quite a while. He has a low chance but not impossible. Why? : This figure is definitely coming. She might be an exclusive somewhere but there is no doubt in my mind that some time in the coming years we will have her figure form. This is almost certainly confirmed thanks to the TV series coming this year. Why? : This figure is a highly requested character that people want made. It was also made into a MU so that make it likely that we will be getting it.